As I mentioned a couple of weeks ago, I am trying to get my house AND life in order. Having less and living simply is where I’m starting…at least that’s the goal. One area of my home that can get messy quickly (besides the kitchen, that’s a whole other animal) is my office. How many times have you walked into your home office only to cringe, turn around, and walk out? I do it ALL THE TIME. If you spend more time thinking up reasons to avoid your office than actually working in it, you may be suffering from ‘mess related stress’…yes, it’s a real thing. It doesn’t matter what you use as a desk…it is going to be the repository for a lot of stuff. Much like a closet, the bigger the desk, the bigger the mess. Getting a larger desk will not solve the clutter problem. 😉 However, organizing the space you have available on your desk will definitely help. Start de-cluttering your desk by making a clean sweep of the top, cubbies, and drawers. You should be left with the essentials, such as the computer, printer, etc. Once you can see your desk’s surfaces (that can be a win in and of itself), the mess that should jump out at you first is the tangle of cords. Even though electrical and computer cords don’t exactly infringe on your workspace, the visual impact will stress your brain. Clear this mess by rounding-up those cords in simple cardboard or foam tubes and get them out of sight. Even something as simple as a bread tie can help get the cords under control. Now that you have a clear surface and hidden/tiddy cords, set up a few containers for those items that you always need. 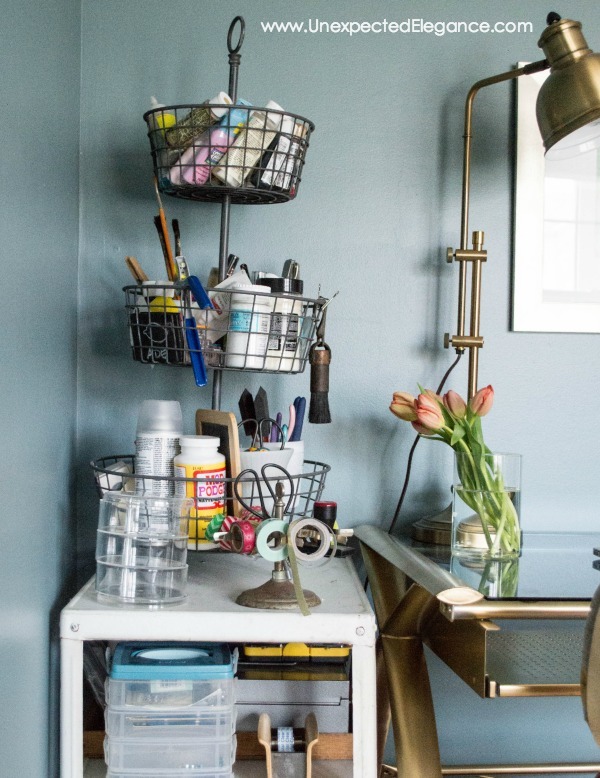 You’ll probably want small bins or cups to hold pens, pencils, and notepads. The idea is to only have on your desk what you need to work, and to have those items stored in easily accessible containers. I always work better in a clean space. It helps me stay focused, what about you? 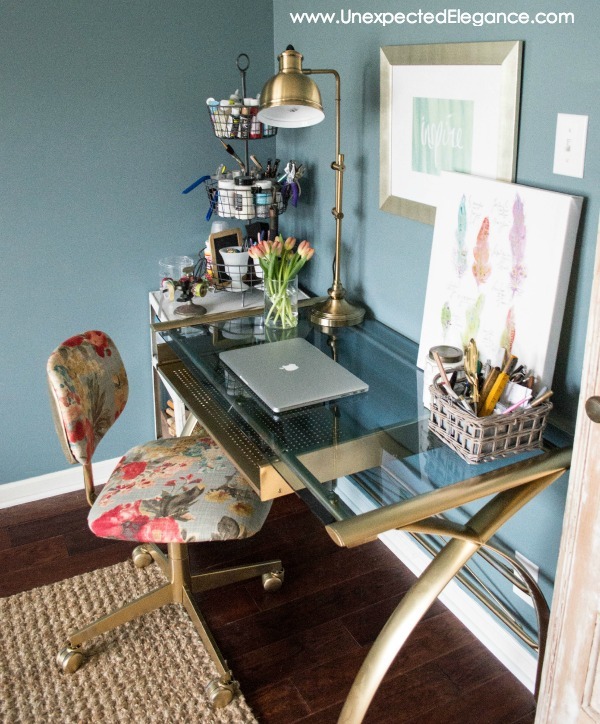 So, rather than pile your desk high with an entire week’s worth of work, choose another area close by to hold the papers, books, journals, or other bulky items you’ll need later. That brings us to the most common home office clutter monster – PAPERS. This includes projects, notes, mail, and all that paperwork we just can’t seem to get rid of. We all have paper to handle every day. We take notes, we get mail, we save receipts – the list is endless, just like the paper. If you tend to toss every piece of paper into the In-Box in your office, it might be time to stop treating all paperwork equally. To set up a system for paperwork that doesn’t just become another pile, you will need to divide your office’s In-Box into categories. The most important “box” is the recycle bin or trash can. Get rid of as much paper as you can the minute it comes into the house! Then sort through the rest. For example, set up three boxes and title them “Immediate,” “Tomorrow,” and “File.” Anything you have to handle before you move onto another task goes into the “Immediate” box. Something that is not as time-sensitive, but needs to be checked again tomorrow, obviously goes into the “Tomorrow” box, and things that don’t need any further consideration can simply go into the “Keep” box to be stored when you have time. If you use this method, remember to keep the papers moving daily, and clean out the filed papers on a routine basis. Even the best storage system or closet fills up when left neglected. You may think “out of sight, out of mind” when it comes to this clutter, but that couldn’t be further from the truth. Just knowing you have mountains of clutter lurking behind closed doors can cause stress. You don’t have to see it every minute of every day to feel that stress gnawing at you. It’s like having a project that has a deadline months out and you know it’s there just waiting for you! Start clearing the stored stuff out of your files, shelves, and closets by first finding out what you actually need to keep. It’s time to discard those “some day we may need these” items. Discarding old paycheck stubs, receipts, and empty boxes is pretty painless. But, the next step can be a bit more difficult. This is the area you dread most – the emotional things. These are the crafts you started, magazines you saved, and other items you kept because you loved something about them. It could be a book or magazine with decorating ideas or recipes you wanted to try. The point is, there are projects lost in a pile and it’s a difficult thing to deal with. The easiest method for clearing the stuff you are emotionally attached to is to get rid of the extras. For example, take pictures of recipes or magazine pages you want to keep and download them to files on your computer or phone, then toss them. Go through all your projects and purge items you no longer need or want. Now that you have your desk cleaned off, your paperwork moving smoothly from start to finish, your filed items purged, and your projects reduced and out of the way, it’s time to sit down and get some work done. 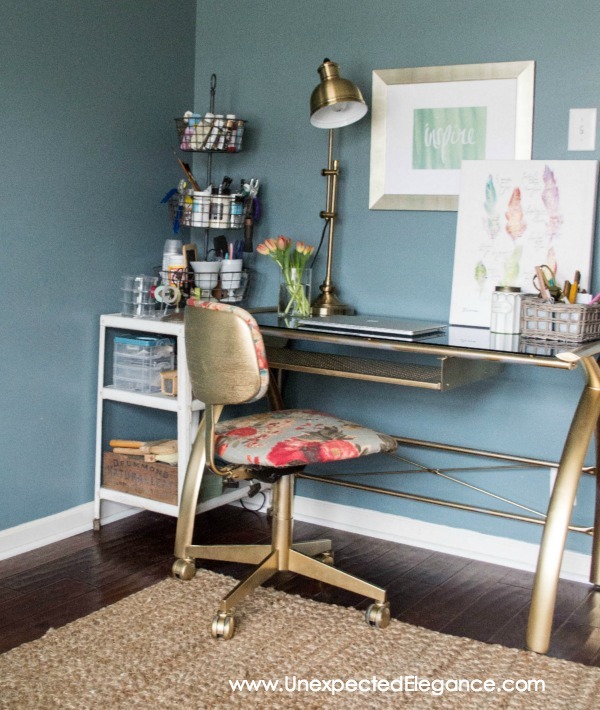 I always get more accomplished when I start with a cluttered-free space, what about you? I like your idea on “Projects” my issue is finding what I want when I want it! In other words actually saving and naming it; can you please offer suggestions on this?